DOC HOLLIDAY & KATE HARONEY Doc Holliday and Kate Haroney were both raised in fine homes. Both were provided with quality educations. Both, by most accounts, should have gone on to live law-abiding lives as well-heeled aristocrats. But both went westward instead, forging new lives for themselves. They found their freedom in the untamed frontier..
At America Remembers, we love country music. If you grew up with it, you know that it stays with you forever. If you’re new to it, you know there is nothing else quite like it. From the emotional intensity of George Jones’ voice to the roots-inspired guitar chords of Marty Stuart— from Conway Twitty’s “Hello .. When the leaves around the country begin to change colors and the air becomes crisp, millions of men and women around the United States will put on their hunting gear and head into the woods. The tradition of hunting has been handed down through generations of sportsmen. For years, the population of many species was ..
Thompson submachine guns have gained quite the following amongst gun collectors over the years. When we hear the term “Tommy Gun”, often used instead of the Thompson submachine gun, we imagine gangsters of the early 20th century shooting at police officers from getaway cars containing large amounts of illegal liquor. It has been said that ..
We have discussed commemorative firearms that honor celebrities and events in our other posts, but how about owning a firearm that is personalized per your specifications to honor someone close to you, or even yourself? America Remembers, a company already known for their beautifully decorated Tribute pistols and rifles, offers a customizable Colt .45 which .. In the world of antique presentation arms, there is no better find than a Colt presentation firearm. Samuel Colt of Hartford, Connecticut not only introduced the world to the first revolving pistol, he reintroduced what it meant to give and to own a specialized work of art. In addition to bringing back the chivalry and .. 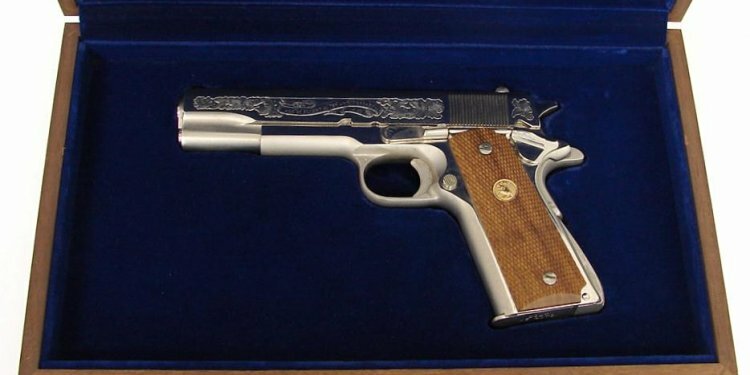 The History of Modern Commemorative Firearms Among collectors and firearms aficionados, there is no grander pleasure than possessing a unique piece of history that is an authentic special presentation model. Firearms have long provided artisans and master craftsmen with an optimal canvas for engraving patterns and portraits, landscapes, and wildlife. The distinguished gentlemen of previous ..